I'm featured over on Paper Crafter's Library today, a proud representative of Graphic 45. Picking a project that represents my work is difficult. I dabble in so many styles, materials and whatnot, that it becomes a task to select one thing that says everything. Getting off track here... I chose this series of altered art pieces for the Paper Crafter's Library feature. I wan't going to use this project to represent my Graphic 45 work at all. I thought that maybe their product wasn't quite glaring enough (companies like when their product is glaring). But truly, it's the versatility of Graphic 45's products that I love. Their designs can be unmistakable... but they can also meld beautifully with authentic vintage rusty bits in altered art. Getting off track again. Here's the featury bit.. 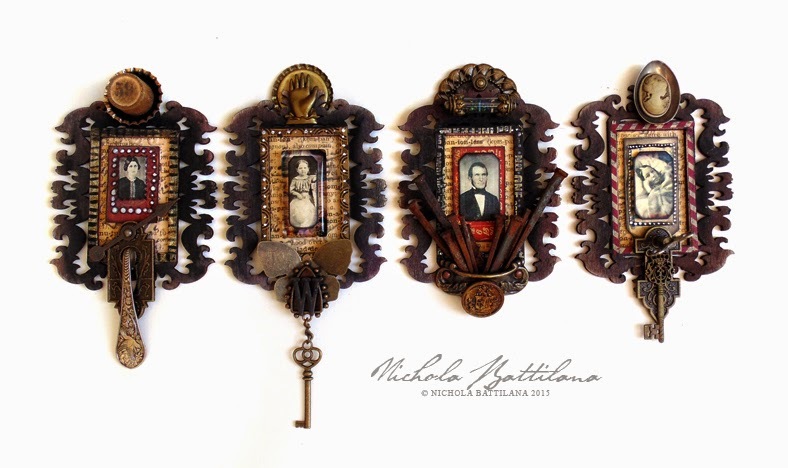 These little altered art pieces were a lot of fun to create. They use a combination of authentic old pieces and new items, including a slew of Graphic 45 metal staples. I’ve used papers from Graphic 45’s Typography (one of my favourite collections!) for the back ground, as well as their washi tape for accents. Altered art is a lot of fun and a great exercise in creating visual balance, texture and layering. It’s a lot like building a puzzle from scratch, with the final picture often telling an unexpected story. I can just see these hanging in a little wall display...really nice. I never would have made this myself...so glad you have a brain that sees such beauty in everyday things. Thank you for sharing with us! Fun pieces and I'll bet you had fun making them, too. If it wasn't for these pieces that you and some of the other artists for Graphic 45 make and showcase I would never have found them! I am a new fan of their products and get the newsletter in my email now. I have also placed a few orders based on the products you and the others feature.